In martial arts, it is the spirit which is of primary importance. Techniques come second. A martial artist with strong fighting spirit (kihaku) can win over any obstacle, tangible or intangible. Attitude overpowers aptitude, like in any other vocation. The techniques, power and strength are born out of physical attributes and are under the command of the human mind. The mind controls the body, and the spirit strengthens the mind. So, in the ultimate kumite, it’s the spirit which wins, not the muscles. 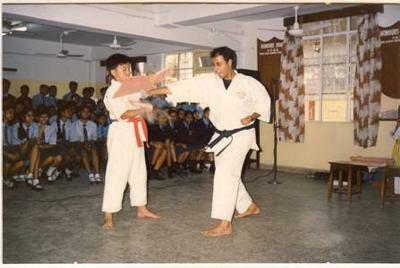 Spirit, character, strong mind, calm and focused mentality, etc are all important aspects of martial arts. The expression ‘mizu no kokoro’ means ‘calmness like the surface of water.’ This mental state is difficult to achieve and all martial artists struggle to attain it. Why? Because, the calm mind, the sublime spirit is all powerful and acts as a dynamo of strength and power. It wins against all odds. "Some people think a martial artist has to be tough against everybody - that's not true at all. A martial artist has to be strong against bad people. But we must also be able to know and understand the feelings, moods and mentalities of good and bad individuals before we can comprehend when to be strong and when to be gentle." "Each one of us starts Karate with some particular reason: to be a good fighter, to keep in good shape, to protect oneself. I wanted to become very strong myself when I first began. But Karate training soon teaches that real strength is facing oneself strictly, with severe eyes. This is the first condition of martial arts training. Therefore, all SKA members must be strong inwardly but quite gentle to others. As we train together, each contributing to a good atmosphere, let's try to bring out that serious strong mentality from deep inside." "Both in fighting and in everyday life, you should be determined though calm. Meet the situation without tenseness yet not recklessly, your spirit settled yet unbiased. Even when your spirit is calm do not let your body relax, and when your body is relaxed do not let your spirit slacken. An elevated spirit is weak and a low spirit is weak." On tournament fighting: "Focus on your preparation, confidence and strategy before each match and your mentality during the match. Don't wait for the outcome to interpret your skill level." On spirit: "Forget your sadness, anger, grudges and hatred. Let them pass like smoke caught in a breeze. You should not deviate from the path of righteousness; you should lead a life worthy of a man. Don't be possessed by greed, luxury, or your ego. You should accept sorrows, sadness and hatred as they are, and consider them a chance for trial given to you by the powers a blessing given by nature. Have both your mind and your time fully engaged in budo, and have your mind deeply set on bujutsu." In the words of Funakoshi sensei, ‘True Karate-do is this: that in daily life, one's mind and body be trained and developed in a spirit of humility; and that in critical times, one be devoted utterly to the cause of justice.’ Hence , we as martial artists must always feel that having a strong spirit is of paramount importance, achieving technical excellence will follow. The martial artist with a pure mind, calm yet focused will have a tremendous forceful spirit and this will result in a mature technical level. All Masters of martial arts have proved it by their words, actions and deeds. The overpowering spirit ensures that we continually stay ahead in the race called life, where there are no traffic signals or U-turn. The spirit thus cannot be defeated, it always wins ! Sensei Arijit Chakraborty holds 4th Dan Black Belt in Shotokan Karate and has training experience of more than 30 years with leading Shotokan Master instructors worldwide. 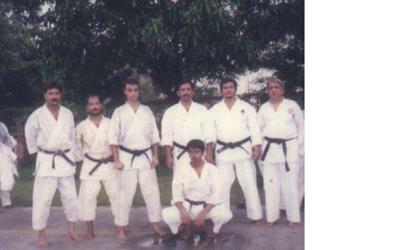 He authored 2 books on karate and has more than 500 technical articles to his credit, published in India and abroad. A qualified CA and MBA, he is a practicing Chartered Accountant. Karate training soon teaches that real strength is facing oneself strictly, with severe eyes.